This stand-alone prequel to Franklin J Schaffner’s ‘Planet of the Apes’ (1968) distinguishes itself from other ill-conceived reboots in general, and from Tim Burton’s disastrous 2001 remake in particular, by looking with fresh, simian eyes at its core conflict between human and primates. Aficionados will note that the plot echoes elements of ‘Conquest of the Planet of the Apes’ (1972), the fourth movie in an already etiolated series. There are also some in-jokes, with the 1968 original even glimpsed on a TV screen at one point. Crucially, though, the events are seen from the point of view of the chimpanzee Caesar, a CGI creature infused with an uncanny nascent humanity by performance-capture master Andy Serkis. The nature of the human/ ape conflict has changed, too, with the racial discrimination so topical in the civil rights era of the late ’60s supplanted by contemporary fears about scientists who play God by experimenting on ‘inferior’ species. The chimp-based research into brain tissue regeneration conducted by scientist Will Rodman (James Franco) for pharmaceutical company GenSys does have a human element; his once musically talented father, Charles (John Lithgow), now has Alzheimer’s. Even so, Rodman concedes that the anarchic aggression displayed by the lab chimps dosed with experimental drug ALZ-112 means that they must be destroyed. However, when the unborn child of chimp Bright Eyes survives this cull, Will takes him home, names him Caeser, and continues his discredited research in secret. As Will’s father regains his faculties, Caeser grows from an inquisitive infant into a strong, super-intelligent adult chimp, one with ‘human’ emotions but also a dangerous aggressive streak. 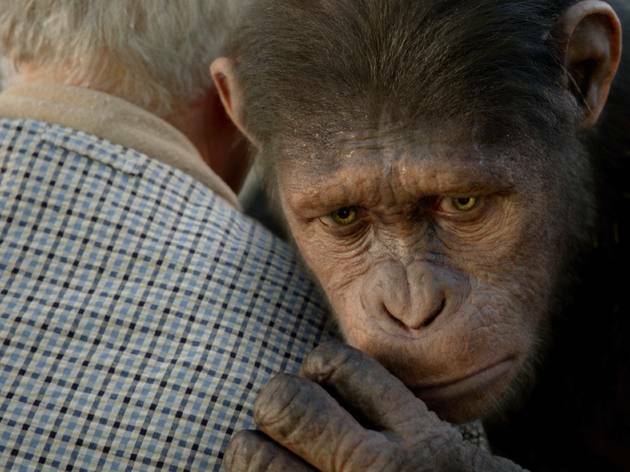 On the insistence of beautiful primatologist Caroline (Freida Pinto), Will exiles Caesar to the San Bruno Primate Sanctuary, where neglect by its owner, Landon (Brian Cox), and the cruelties meted out by his son, Dodge (Tom Felton), provoke the chimp into fomenting an ape rebellion. Once free, the weapon-wielding apes invade the streets of San Francisco, terrorising and killing its human inhabitants. Despite a quantum leap from his low-budget British prison movie ‘The Escapist’ to this $90 million blockbuster, director Rupert Wyatt stages the climactic battle on the city’s Golden Gate Bridge – a stunning set-piece featuring hundreds of life-like apes – with remarkable assurance. He also strives to match the philosophical seriousness of the first ‘Apes’ film, but his handling of the underdeveloped characters is never as convincing as the visual effects work. Also, particularly in the ferocious battle scenes, there is far too much special pleading on behalf of the selectively violent apes. Real sci-fi is based on science. The 60's original has a satisfying amount of scientific rigor. The screenwriter has a poor understanding of evolution. An unrealistic premise means the movie fails as rigorous sci fi, regardless of it's entertainment value. I didnt like any of the previous films so wasnt too sure about this one. However thoroughly enjoyed it, great storyline, great film. Cant wait to watch again! Pretty darn good. 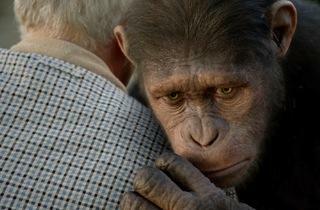 Well acted and Andy Serkis did a fab job as Ceaser. Ok, the supporting cast are a bit lame and you care not when the apes go...ape :-) But a fun yarn non-the-less. A smart scientist wants to cure his dad's alzheimer's with a clever new viral drug he's testing out on chimps - as you do. A side effect is that the monkey gets increased intelligence but the a newer version of the drug also harms us humans. I cheered when the chimps copped it but was booed out by the rest of the audience who seemed to want all of humanity overtaken by the newly bright hairy fellows. A word of advice the film doesn't quite end when the credits roll - stay in your comfy chairs - there's more insight to be revealed. good special effects and quite enjoyable at first but the lack of any interesting characters and fairly silly, cliche script mean you might lose interest quickly. Another wasted opportunity. This film was so good, i really enjoyed watching it and thought it was beter than any of the other planet of the apes films. It was so realistic and the story behind it was really effective which made me like it more. I would definately reccomend you go see this it is worth it. I would go watch it again! My first five star score surprisingly for a blockbuster that was very entertaining for my teenage daughter and I. My Mum had Alzheimers so an extra edge to this story and how desperatre we children can be to help them. Might even see the film again to enjoy a good use of cgi compared to the nonsense peddled in other blockbusters. Good value night out, and stay seated for at the end of the film as the story isn't quite over! A truly stunning achievement. It brings state of the art special effects and expert direction right before your eyes. Those who feel disappointed by this film are probably victims of their own belief that this film is meant to be more than an entertaining monkey movie. Monkey see - monkey do applies in more ways than one here. I for one am looking forward to the directors next film. 5 stars to all concerned. If this film doesnt win the best editing at the Oscars, I'll eat your hat. I thought the film was very good for its genre. Okay so you could tell that the apes were animated but nevertheless on occsion I did forget this and got lost in the film. For me the true irony was that of the apes going ape. Pacy and enjoyable but lacking the emotional power and disturbing atmosphere of the original. reallly good i have learnt to look at viewers reviews rather than critics, they are much better guide to whether i will enjoy a film or not. Probably the best of this summers films apart from the Potter finale. I wonder whether the film is mostly comprised of British actors playing Americans, excluding Franco and John Lithgow, because they were all cheap compared to well known American's playing the same roles. Most of the budget seems to have gone on the CGI apes (and certainly most of the manpower is in this area if you sit through the massive list of CGI artists and ancillary workers in the end credits). Cox goes through the motions, Felton reprises his spoilt brat act from Harry Potter and Pinto is more wooden than the giant redwoods in the film. The film though belongs to Serkis and Franco who are superb. It sadly has the ongoing franchise opener ending written all over it with more questions left open than answered. Worth seeing. Best film of Summer 2011. Franco is good but (oddly) the main actor in the film is a completely animated thing. Although it's clear we're not looking at a real ape, the SFX are still amazing; the colour of the eyes, the texture of the hair and the life-like facial expressions. The original Apes films suffered from lack of budget and poor makeup effects (I still enjoyed them though). This new version has the budget and necessary effects to tell the story the way it should be told. There are a few updates and changes here and there but this film is essentially a remake/reboot of Conquest. Fingers crossed it makes enough at the box office to warrant a sequel. Pretty good. Looking forward to the sequel. An amazing film with lots of action (suitable for ages 10) rated 12a! freida pinto is v beautiful but is truly cardboard as an actress. she can barely get the lines out. never mind deliver them with any kind of drama or emotion. stick to haircare adverts plz. loved this film otherwise. and perfect timing with the london riots!